Pioneers in the industry, we offer grand wedding stage, modern wedding and reception stage, royal wedding and reception stage, royal panel wedding stage, grand designer wedding and reception stage and grand traditional wedding and reception stage from India. 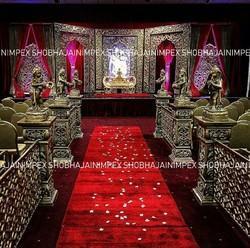 Wedding Stage theme commonly comprises of a stunning setting, which can be our masterly custom fitted hanging or you can browse our scope of hand embroided backgrounds some of which highlight excellent Gems to additionally improve your Stylistic theme. Bespoke plans can be made to change your occasion, which are customized to theme and spending plan. 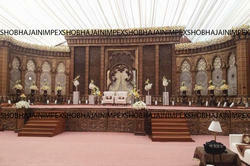 Our Wedding Stage can be controlled to make new structures with the goal that we can build one of a kind stages outlines. 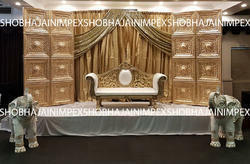 These ideas and outlines can be utilized for Walima and Nikah stages, Hindu weddings or provide the ideal settings for any wedding, event or reception. 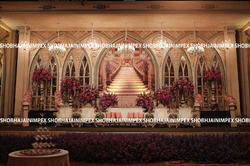 Looking for Wedding and Reception Stages & Grand Wedding ?